Thankfully, good video subtitles are getting easier to find. The video site Viki, for example, made its reputation on great subtitles. Fan translations of videos from around the world, including cult favourite Korean dramas, are accessible in over 160 languages, and the care and attention paid by these superfans make for exceptional translations that stay true to the original intent of the material. The result is over 22 million unique visitors a month, and increased engagement and investment on the part of the community. TED.com is another great example – high quality, informative content is in demand everywhere, and users contribute video subtitles as a way of sharing it. The end result is high quality, because of the enthusiasm for the content. YouTube is handling caption translation through a partnership with Amara, the crowdsourced subtitling platform; users can connect their videos via a free account, inviting viewers to help translate their transcripts. It’s a great system for popular videos, or companies with a good base of international fans to draw from. That the world is sharing culture this way should be enough to grab the interest of any marketer. It’s encouraging to know that you can take a message across borders and find a receptive audience. The key to making it work is in respecting that audience and understanding the way they communicate, and getting the subtitles right is an essential part of that. 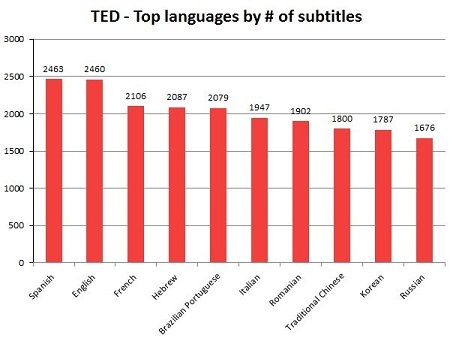 Who would think that Polish would be the second most subtitled language on OpenSubtitles.org? This reminds us, once again, that culture and user behavior play a big part in localization and basing marketing decisions solely on language data (ie total # of speakers) can lead to false assumptions. Maybe Polish people are technically and linguistically more qualified for creating video subtitles? Or they’re more interested in foreign shows than Brazilians? Crowdsourcing is a more and more popular option, and it works well for big passion projects like Viki, but it’s not ideal for every business. To begin with, most companies don’t have access to qualified bilingual clientele to perform the work. When willing participants are there, the oversight can be costly; large companies like Twitter that employ massive numbers of volunteer translators maintain full-time departments to keep policies up to date and monitor quality. Making a leap of faith with crowdsourcing can definitely pay off, but there is a serious investment to be made at the outset. More importantly, if the video being localized and translated is intended to communicate directly with prospective clients, the leap of faith might be more than a business is comfortable with. If a message needs to be communicated properly and consistently across different languages and for different cultures, without causing awkward misunderstandings, then there is really no room for error. Crowdsourcing, especially with volunteers, does not come with absolute guarantees. The democratic nature of the internet means that crowdsourced subtitles will only become more widespread in the future. Savvy users of the globalized internet see subtitle translation as an extension of the sharing they’re already doing on social networks, and that’s unlikely to change. The key, though, will always be goodwill – nobody is going to translate something they aren’t excited about for free. 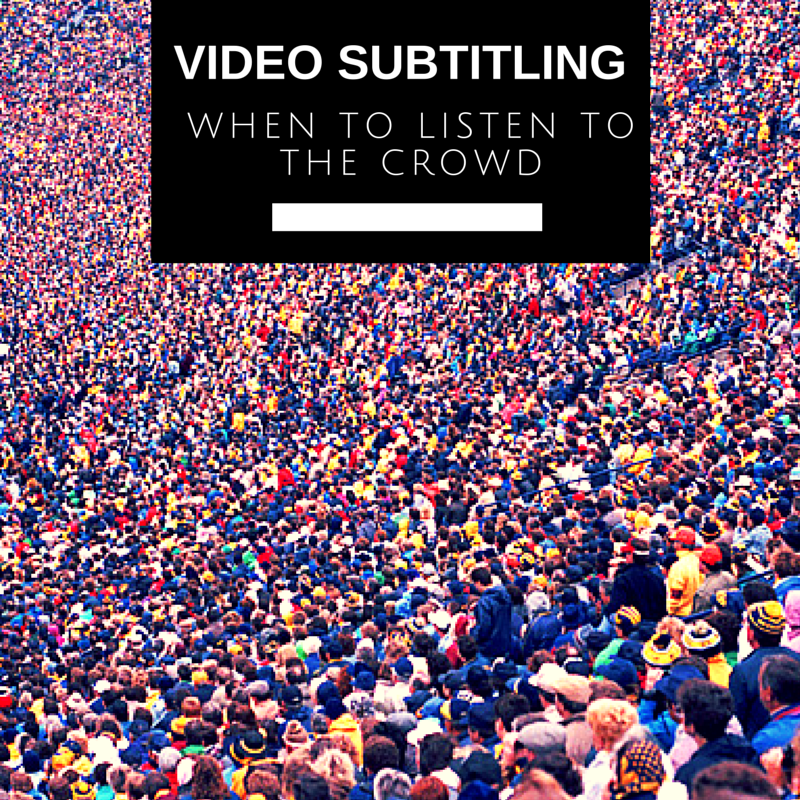 Questions about subtitling and video localization? We’d love to hear them! Ask away in the comments.